Setting up a calm down space for kids is a positive way to help kids learn emotional self-regulation. Here are some tips on how to create the perfect calm down corner at home! One thing we have worked really hard on with my son J over the past couple of years is self-regulation and coping skills. He has made great gains in this area through a variety of methods, but one thing I swear by is creating a dedicated calm down space at home. While our basement looks like a full blown occupational therapy sensory room, J's bedroom, on the other hand, is where he goes when he needs a safe space to go to calm his body and emotions. He can crash into a bean bag chair or squeeze his stuffies for some deep pressure or draw some intersections (he loves traffic lights!) or Geometry Dash levels on some old printer paper. The kind with the dotted strips along the side that you have to rip off. Yes, that really old printer paper that's practically see-through. I've shared my favorite resources and tips for creating a calm down space for your kids so that you can create a safe space at home for your kids too! I've talked a lot about calm down kits recently as a great tool for helping kids learn to self-regulate their emotions and bodies. I especially love that you can make a calm down kit as portable as you'd like so that you can take it on the go with you. However, I really prefer having a dedicated calm down space in our house for J to retreat to when he is overwhelmed and anxious. It is the first place he goes as soon as he gets home from school, which has drastically cut down on the number of after school meltdowns. 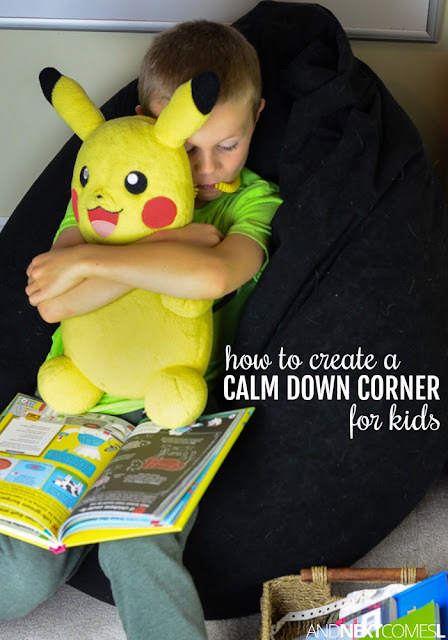 J's calm down corner is a space in his bedroom that includes a large whiteboard for doodling on, a desk filled with plenty of scrap paper and pencils, a bean bag chair, books, chewies, and, of course, his beloved Pikachu from Build-A-Bear. He also has the board game Rush Hour in his corner and finds playing some of the hard levels calms him too. Usually he just needs some quiet time to write and draw in order to self-regulate, which is why we have included so many things to draw with. If you need some inspiration to help you build your own calm down corner for kids, then you'll want to check out these free printables in addition to the tips I have shared over at CBC Parents. This is fantastic, Dyan! What I love about the creation of your safe space is that it really emphasizes the elements that your son finds uniquely comforting. A lot of my work as an OT is detective work to discover what clicks for the people I'm working with. Being a parent requires the same. 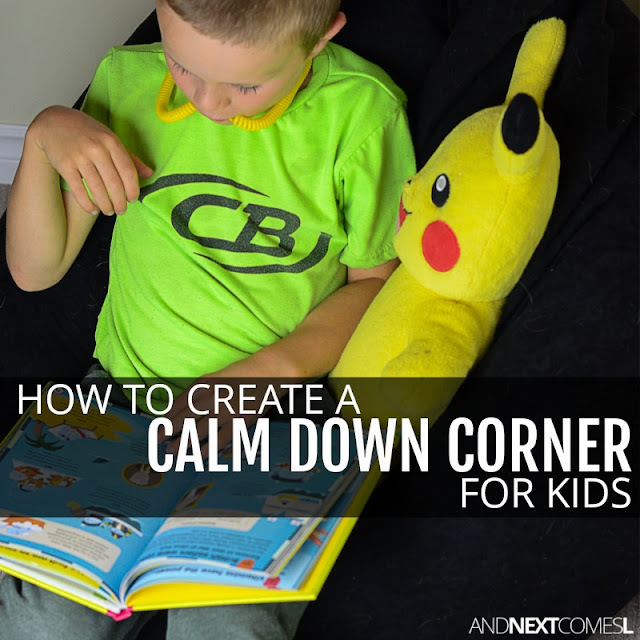 The amount of thought and attention you've put into your son's calm corner is likely why it works!